The first half of the 20th century saw the world entangled in two global wars, conducted with an unprecedented brutality. The First World War developed from a purely European affair into a conflict involving the colonies and the United States. It altered Europe's political landscape and shifted the power balance worldwide. In World War II, the nations of Europe, Asia, the Americas, and Africa were drawn into the conflict through the aggressive policies of an ambitious Nazi Germany. The war was conducted with the most up-to-date weapons technology and cost the lives of more than 55 million people. The Holocaust, the systematic annihilation of the European Jews, represented an unparalleled moral catastrophe for modern civilization. Rampant nationalism and an international arms race made European politics potentially explosive at the beginning of the 20th century. It took only the assassination of the Austro-Hungarian heir apparent in July 1914 to ignite a world war that tore apart the 1 old state structures. Totalitarian political forces emerged, strengthened by the social and economic crises of the postwar period. In 1939, German Nazism plunged the world into the most devastating war in history. At the war's end in 1945, Europe lay in ruins. The First World War, waged with all the resources then available, shifted worldwide power relationships and redrew the 2 map of Europe. Even the militarily victorious nations Great Britain and France were economically weakened by the war. The United States profited most from the war. replacing Great Britain as the dominant world power, and it sought to bring peace to Europe based on the principle of the right to national self-determination. The postwar order created in Paris by the victorious powers was contradictory, however. It became the source of new conflicts and thereby set the stage for the next war. The military losers bristled at being assigned sole responsibility for the war and saw the reparations that they had been saddled with as greatly unjust. Germany in particular, which was forced to cede its colonies and large parts of its empire, sought revisions in the treaty from the start. The breakup of the multicultural empires of Austria-Hungary and the Ottomans created unstable nation-states in Eastern and Central Europe with strong ethnic minorities. In the 5 Near East, the victorious powers broke their promise to grant national independence. The former territories of the Ottoman Empire were divided into British, French, and international mandates. Great Britain's inconsistent posture toward Jewish immigration into Palestine set the groundwork for the Arab-Israeli conflict that would erupt after 1945. World War I mobilized and politicized whole nations for the first time. It shook up the established social order in many countries and led to revolts and revolutions. Centuries-old monarchies collapsed in Russia. Germany, Austria, and Hungary. Parliamentary democracies were established, with mixed success, in many places. The most momentous development proved to be the 3 Bolsheviks' victory in Russia in 1917. The founding of the Soviet Union in 1922 influenced the internal development of the whole of Europe. The Soviet goal of a communist world revolution stirred up fears of left-wing communist uprisings by broad sections of the populace in the unstable European democracies of the 4 postwar period. In response, new right-wing fascist factions gained strength everywhere. Although these varied greatly from country to country, they all had a militarily nationalist, radical antidemocratic and anticommunist position in common. These movements gained the upper hand in Germany and Italy against the backdrop of the worldwide economic depression. In Spain a fascist regime was establsihed only after a bloody civil war. Authoritarian systems also established themselves in South America, and a nationalist military leadership in Japan sought to establish a colonial empire in Asia. In China, the most populous nation of the world, nationalist and communist factions fought for control. Among the leading powers, only France, the United States and Great Britain retained their liberal democratic systems despite economic crises. An aggressive fascist movement gained power in Germany in the form of Hitler's National Socialist party. The German Reich started 6 World War II in 1939 with the goal of reorganizing Europe according to Nazi racial theory. 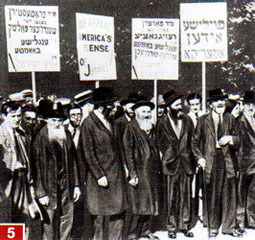 An extermination campaign was begun against entire ethnic groups in Eastern Europe, which culminated in the mass murder of millions of European Jews. The United States, Great Britain, and the Soviet Union formed an alliance that finally put an end to the Nazis' rule of terror and occupied Germany in 1945. Germany's ally Japan surrendered only after the first atomic bombs had been dropped. World War II, which was waged with highly developed technology and an enormous numbers of soldiers, cost the lives of more than 55 million people. The carpet bombing by the air forces claimed appalling numbers of victims and destroyed complete cities. As a result of the war, the Soviet Union and the United States rose to become the two world superpowers. After 1945, the differences between them, however, led to the ideological division of both Europe and the entire world. The development of science and technology in the industrialized nations between the wars fundamentally altered daily life. In 1915, physicist 9 Albert Einstein published his General Theory of Relativity and revolutionized the concept of time and space. 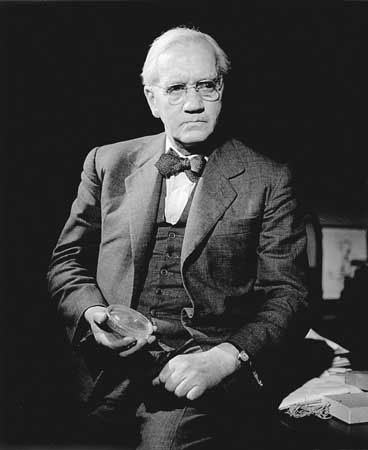 In 1929, bacteriologist 7 Sir Alexander Fleming discovered the medical use of penicillin. Thanks to the 8 assembly line, the car became the means of transport for the masses. Life in the cities became more hectic and dynamic, as new and more efficient technology led to an increase in the pace of everyday life. Communication over further distances and within a shorter amount of time was made possible, and increasing numbers of people began to move further away from their place of origin in the search of work and happiness, aided by the new mobility given them by the car. born March 14, 1879, Ulm, Württemberg, Ger. died April 18, 1955, Princeton, N.J., U.S.
German-born physicist who developed the special and general theories of relativity and won the Nobel Prize for Physics in 1921 for his explanation of the photoelectric effect. Einstein is generally considered the most influential physicist of the 20th century. 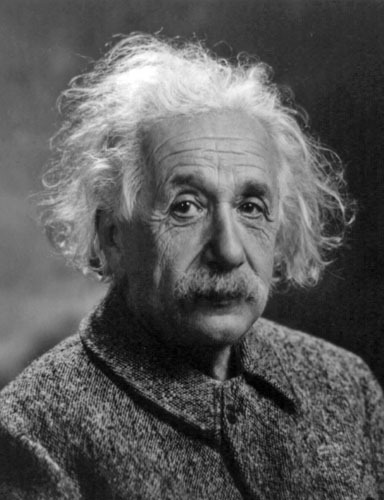 Einstein�s parents were secular, middle-class Jews. His father, Hermann Einstein, was originally a featherbed salesman and later ran an electrochemical factory with moderate success. His mother, the former Pauline Koch, ran the family household. He had one sister, Maja, born two years after Albert. Yet another important influence on Einstein was a young medical student, Max Talmud (later Max Talmey), who often had dinner at the Einstein home. Talmud became an informal tutor, introducing Einstein to higher mathematics and philosophy. A pivotal turning point occurred when Einstein was 16. Talmud had earlier introduced him to a children�s science series by Aaron Bernstein, Naturwissenschaftliche Volksbucher (1867�68; Popular Books on Physical Science), in which the author imagined riding alongside electricity that was traveling inside a telegraph wire. Einstein then asked himself the question that would dominate his thinking for the next 10 years: What would a light beam look like if you could run alongside it? If light were a wave, then the light beam should appear stationary, like a frozen wave. Even as a child, though, he knew that stationary light waves had never been seen, so there was a paradox. Einstein also wrote his first �scientific paper� at that time (�The Investigation of the State of Aether in Magnetic Fields�). Einstein�s education was disrupted by his father�s repeated failures at business. In 1894, after his company failed to get an important contract to electrify the city of Munich, Hermann Einstein moved to Milan, Italy, to work with a relative. Einstein was left at a boarding house in Munich and expected to finish his education. Alone, miserable, and repelled by the looming prospect of military duty when he turned 16, Einstein ran away six months later and landed on the doorstep of his surprised parents. His parents realized the enormous problems that he faced as a school dropout and draft dodger with no employable skills. His prospects did not look promising. In 1902 Einstein reached perhaps the lowest point in his life. He could not marry Maric and support a family without a job, and his father�s business went bankrupt. Desperate and unemployed, Einstein took lowly jobs tutoring children, but he was fired from even these jobs. The turning point came later that year, when the father of his lifelong friend, Marcel Grossman, was able to recommend him for a position as a clerk in the Swiss patent office in Bern. About then Einstein�s father became seriously ill and, just before he died, gave his blessing for his son to marry Maric. For years, Einstein would experience enormous sadness remembering that his father had died thinking him a failure. 1. Über einen die Erzeugung und Verwandlung des Lichtes betreffenden heuristischen Gesichtspunkt (�On a Heuristic Viewpoint Concerning the Production and Transformation of Light�), in which Einstein applied the quantum theory to light in order to explain the photoelectric effect. If light occurs in tiny packets (later called photons), then it should knock out electrons in a metal in a precise way.2. Über die von der molekularkinetischen Theorie der Wärme geforderte Bewegung von in ruhenden Flüssigkeiten suspendierten Teilchen (�On the Movement of Small Particles Suspended in Stationary Liquids Required by the Molecular-Kinetic Theory of Heat�), in which Einstein offered the first experimental proof of the existence of atoms. By analyzing the motion of tiny particles suspended in still water, called Brownian motion, he could calculate the size of the jostling atoms and Avogadro�s number (see Avogadro�s law).3. Zur Elektrodynamik bewegter Körper (�On the Electrodynamics of Moving Bodies�), in which Einstein laid out the mathematical theory of special relativity.4. Ist die Trägheit eines Körpers von seinem Energieinhalt abhängig? (�Does the Inertia of a Body Depend Upon Its Energy Content?�), submitted almost as an afterthought, which showed that relativity theory led to the equation E = mc2. This provided the first mechanism to explain the energy source of the Sun and other stars. In the 19th century there were two pillars of physics: Newton�s laws of motion and Maxwell�s theory of light. Einstein was alone in realizing that they were in contradiction and that one of them must fall. At first Einstein�s 1905 papers were ignored by the physics community. This began to change after he received the attention of just one physicist, perhaps the most influential physicist of his generation, Max Planck, the founder of the quantum theory. Soon, owing to Planck�s laudatory comments and to experiments that gradually confirmed his theories, Einstein was invited to lecture at international meetings, such as the Solvay Conferences, and he rose rapidly in the academic world. He was offered a series of positions at increasingly prestigious institutions, including the University of Zürich, the University of Prague, the Swiss Federal Institute of Technology, and finally the University of Berlin, where he served as director of the Kaiser Wilhelm Institute for Physics from 1913 to 1933 (although the opening of the institute was delayed until 1917). Even as his fame spread, Einstein�s marriage was falling apart. He was constantly on the road, speaking at international conferences, and lost in contemplation of relativity. The couple argued frequently about their children and their meager finances. Convinced that his marriage was doomed, Einstein began an affair with a cousin, Elsa Löwenthal, whom he later married. (Elsa was a first cousin on his mother�s side and a second cousin on his father�s side.) When he finally divorced Mileva in 1919, he agreed to give her the money he might receive if he ever won a Nobel Prize. One of the deep thoughts that consumed Einstein from 1905 to 1915 was a crucial flaw in his own theory: it made no mention of gravitation or acceleration. His friend Paul Ehrenfest had noticed a curious fact. If a disk is spinning, its rim travels faster than its centre, and hence (by special relativity) metre sticks placed on its circumference should shrink. This meant that Euclidean plane geometry must fail for the disk. For the next 10 years, Einstein would be absorbed with formulating a theory of gravity in terms of the curvature of space-time. To Einstein, Newton�s gravitational force was actually a by-product of a deeper reality: the bending of the fabric of space and time. Today physicists refer to the equations as the Einstein-Hilbert action, but the theory itself is attributed solely to Einstein. Einstein was convinced that general relativity was correct because of its mathematical beauty and because it accurately predicted the perihelion of Mercury�s orbit around the Sun (see Mercury: Mercury in tests of relativity). His theory also predicted a measurable deflection of light around the Sun. As a consequence, he even offered to help fund an expedition to measure the deflection of starlight during an eclipse of the Sun. After the war, two expeditions were sent to test Einstein�s prediction of deflected starlight near the Sun. One set sail for the island of Principe, off the coast of West Africa, and the other to Sobral in northern Brazil in order to observe the solar eclipse of May 29, 1919. On Nov. 6, 1919, the results were announced in London at a joint meeting of the Royal Society and the Royal Astronomical Society. This result is not an isolated one, it is a whole continent of scientific ideas.�This is the most important result obtained in connection with the theory of gravitation since Newton�s day, and it is fitting that it should be announced at a meeting of the Society so closely connected with him. The headline of The Times of London read, �Revolution in Science�New Theory of the Universe�Newton�s Ideas Overthrown�Momentous Pronouncement�Space �Warped.�� Almost immediately, Einstein became a world-renowned physicist, the successor to Isaac Newton. Einstein also launched the new science of cosmology. His equations predicted that the universe is dynamic�expanding or contracting. This contradicted the prevailing view that the universe was static, so he reluctantly introduced a �cosmological term� to stabilize his model of the universe. In 1929 astronomer Edwin Hubble found that the universe was indeed expanding, thereby confirming Einstein�s earlier work. 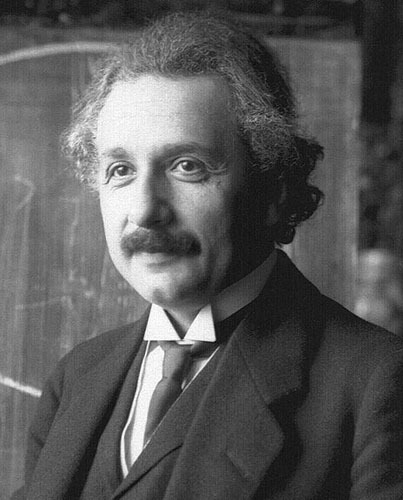 In 1930, in a visit to the Mount Wilson Observatory near Los Angeles, Einstein met with Hubble and declared the cosmological constant to be his �greatest blunder.� Recent satellite data, however, have shown that the cosmological constant is probably not zero but actually dominates the matter-energy content of the entire universe. Einstein�s �blunder� apparently determines the ultimate fate of the universe. It was interesting to see them together�Tagore, the poet with the head of a thinker, and Einstein, the thinker with the head of a poet. It seemed to an observer as though two planets were engaged in a chat. I�m not an atheist and I don�t think I can call myself a pantheist. We are in the position of a little child entering a huge library filled with books in many different languages.�The child dimly suspects a mysterious order in the arrangement of the books but doesn�t know what it is. That, it seems to me, is the attitude of even the most intelligent human being toward God. 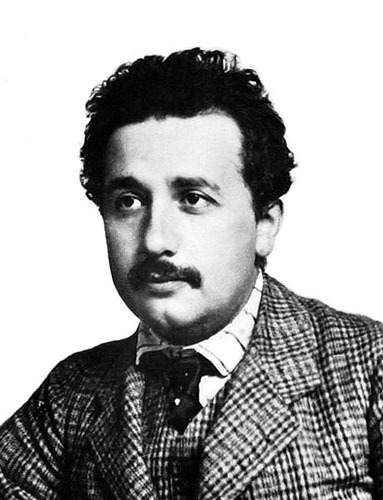 Inevitably, Einstein�s fame and the great success of his theories created a backlash. The rising Nazi movement found a convenient target in relativity, branding it �Jewish physics� and sponsoring conferences and book burnings to denounce Einstein and his theories. The Nazis enlisted other physicists, including Nobel laureates Philipp Lenard and Johannes Stark, to denounce Einstein. One Hundred Authors Against Einstein was published in 1931. When asked to comment on this denunciation of relativity by so many scientists, Einstein replied that to defeat relativity one did not need the word of 100 scientists, just one fact. In December 1932 Einstein decided to leave Germany forever (he would never go back). It became obvious to Einstein that his life was in danger. A Nazi organization published a magazine with Einstein�s picture and the caption �Not Yet Hanged� on the cover. There was even a price on his head. So great was the threat that Einstein split with his pacifist friends and said that it was justified to defend yourself with arms against Nazi aggression. To Einstein, pacifism was not an absolute concept but one that had to be re-examined depending on the magnitude of the threat. Einstein settled at the newly formed Institute for Advanced Study at Princeton, N.J., which soon became a mecca for physicists from around the world. Newspaper articles declared that the �pope of physics� had left Germany and that Princeton had become the new Vatican. The 1930s were hard years for Einstein. 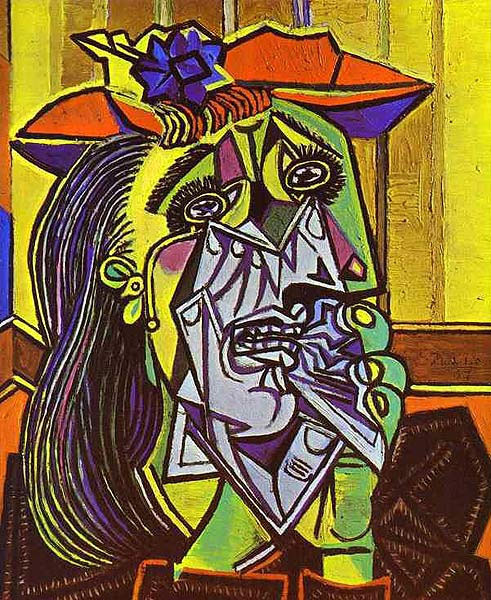 His son Eduard was diagnosed with schizophrenia and suffered a mental breakdown in 1930. (Eduard would be institutionalized for the rest of his life.) Einstein�s close friend, physicist Paul Ehrenfest, who helped in the development of general relativity, committed suicide in 1933. And Einstein�s beloved wife, Elsa, died in 1936. To his horror, during the late 1930s, physicists began seriously to consider whether his equation E = mc2 might make an atomic bomb possible. In 1920 Einstein himself had considered but eventually dismissed the possibility. However, he left it open if a method could be found to magnify the power of the atom. Then in 1938�39 Otto Hahn, Fritz Strassmann, Lise Meitner, and Otto Frisch showed that vast amounts of energy could be unleashed by the splitting of the uranium atom. The news electrified the physics community. 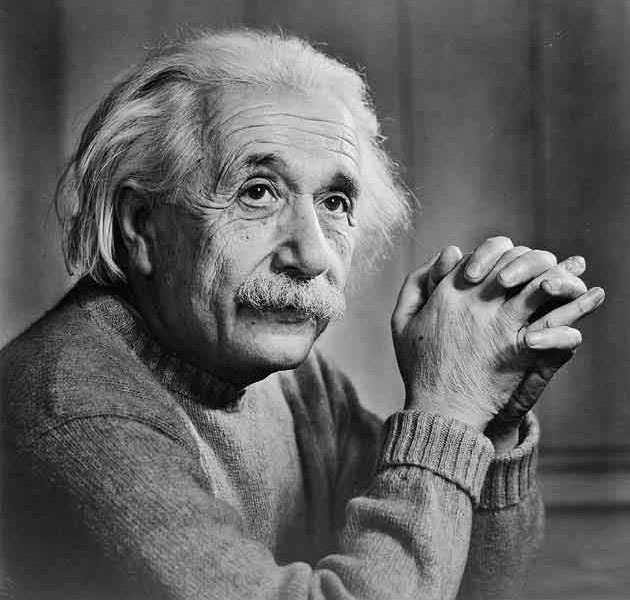 Einstein was granted permanent residency in the United States in 1935 and became an American citizen in 1940, although he chose to retain his Swiss citizenship. During the war, Einstein�s colleagues were asked to journey to the desert town of Los Alamos, N.M., to develop the first atomic bomb for the Manhattan Project. 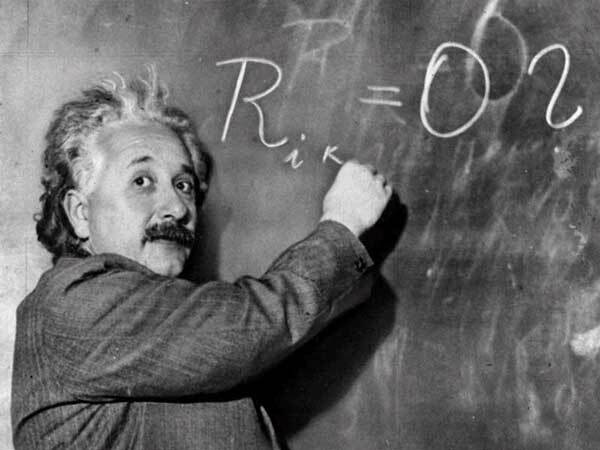 Einstein, the man whose equation had set the whole effort into motion, was never asked to participate. 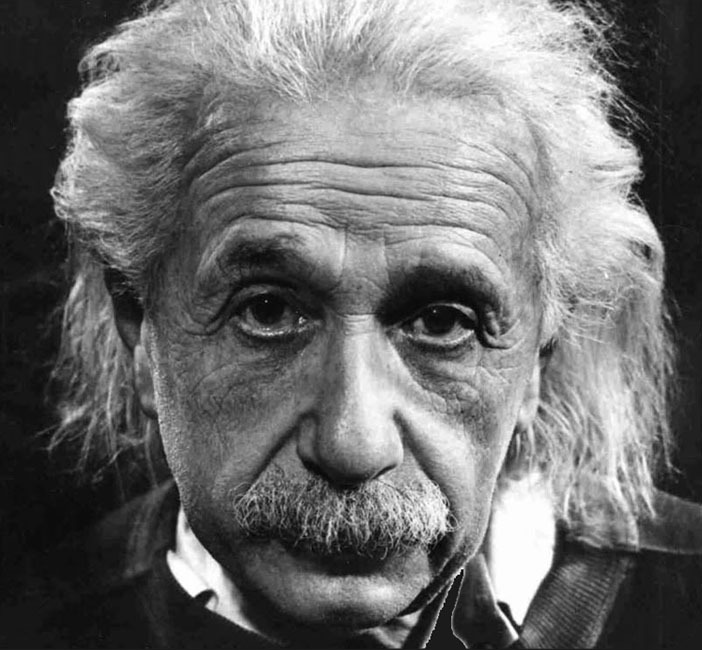 Voluminous declassified Federal Bureau of Investigation (FBI) files, numbering several thousand, reveal the reason: the U.S. government feared Einstein�s lifelong association with peace and socialist organizations. (FBI director J. Edgar Hoover went so far as to recommend that Einstein be kept out of America by the Alien Exclusion Act, but he was overruled by the U.S. State Department.) Instead, during the war Einstein was asked to help the U.S. Navy evaluate designs for future weapons systems. 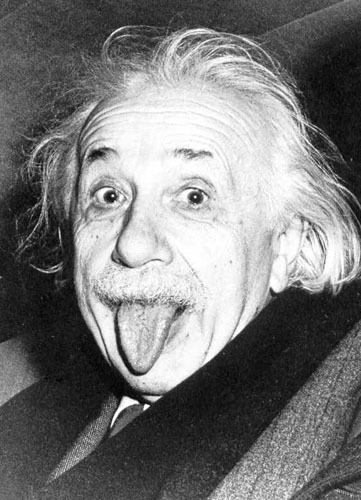 Einstein also helped the war effort by auctioning off priceless personal manuscripts. In particular, a handwritten copy of his 1905 paper on special relativity was sold for $6.5 million. It is now located in the Library of Congress. In 1952 David Ben-Gurion, Israeli�s premier, offered Einstein the post of president of Israel. Einstein, a prominent figure in the Zionist movement, respectfully declined. The other reason for Einstein�s increasing detachment from his colleagues was his obsession, beginning in 1925, with discovering a unified field theory�an all-embracing theory that would unify the forces of the universe, and thereby the laws of physics, into one framework. In his later years he stopped opposing the quantum theory and tried to incorporate it, along with light and gravity, into a larger unified field theory. Gradually Einstein became set in his ways. He rarely traveled far and confined himself to long walks around Princeton with close associates, whom he engaged in deep conversations about politics, religion, physics, and his unified field theory. In 1950 he published an article on his theory in Scientific American, but because it neglected the still-mysterious strong force, it was necessarily incomplete. When he died five years later of an aortic aneurysm, it was still unfinished. born Aug. 6, 1881, Lochfield Farm, Darvel, Ayrshire, Scot. died March 11, 1955, London, Eng. Scottish bacteriologist best known for his discovery of penicillin. Fleming had a genius for technical ingenuity and original observation. His work on wound infection and lysozyme, an antibacterial enzyme found in tears and saliva, guaranteed him a place in the history of bacteriology. But it was his discovery of penicillin in 1928, which started the antibiotic revolution, that sealed his lasting reputation. Fleming was recognized for this achievement in 1945, when he received the Nobel Prize for Physiology or Medicine, along with Australian pathologist Howard Walter Florey and British biochemist Ernst Boris Chain, both of whom isolated and purified penicillin. Fleming was the seventh of eight children of a Scottish hill farmer (third of four children from the farmer�s second wife). His country upbringing in southwestern Scotland sharpened his capacities for observation and appreciation of the natural world at an early age. He began his elementary schooling at Loudoun Moor and then moved on to a larger school at Darvel before enrolling in Kilmarnock Academy in 1894. In 1895 he moved to London to live with his elder brother Thomas (who worked as an oculist) and completed his basic education at Regent Street Polytechnic. After working as a London shipping clerk, Fleming began his medical studies at St. Mary�s Hospital Medical School in 1901, funded by a scholarship and a legacy from his uncle. There he won the 1908 gold medal as top medical student at the University of London. At first he planned to become a surgeon, but a temporary position in the laboratories of the Inoculation Department at St. Mary�s Hospital persuaded him that his future lay in the new field of bacteriology. There he came under the influence of bacteriologist and immunologist Sir Almroth Edward Wright, whose ideas of vaccine therapy seemed to offer a revolutionary direction in medical treatment. Between 1909 and 1914, Fleming established a successful private practice as a venereologist, and in 1915 he married Sarah Marion McElroy, an Irish nurse. Fleming�s son, Robert, born in 1924, followed his father into medicine. Fleming was one of the first doctors in Britain to administer arsphenamine (Salvarsan), a drug effective against syphilis that was discovered by German scientist Paul Ehrlich in 1910. During World War I, Fleming had a commission in the Royal Army Medical Corps and worked as a bacteriologist studying wound infections in a laboratory that Wright had set up in a military hospital housed in a casino in Boulogne, France. There he demonstrated that the use of strong antiseptics on wounds did more harm than good and recommended that the wounds simply be kept clean with a mild saline solution. 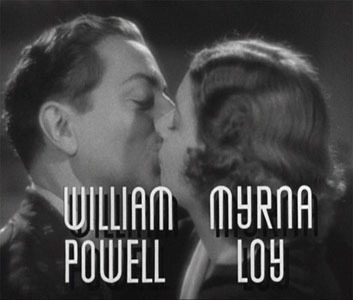 Returning to St. Mary�s after the war, Fleming was promoted to assistant director of the Inoculation Department. Years later, in 1946, he succeeded Wright as principal of the department, which was renamed the Wright-Fleming Institute. In November 1921 Fleming discovered lysozyme, an enzyme present in body fluids such as saliva and tears that has a mild antiseptic effect. This was the first of his major discoveries. It came about when he had a cold and a drop of his nasal mucus fell onto a culture plate of bacteria. Realizing that his mucus might have an effect on bacterial growth, he mixed the mucus into the culture and a few weeks later saw signs of the bacteria having been dissolved. Fleming�s study of lysozyme, which he considered his best work as a scientist, was a significant contribution to the understanding of how the body fights infection. Unfortunately, lysozyme had no effect on the most pathogenic bacteria. On Sept. 3, 1928, shortly after his appointment as professor of bacteriology, Fleming noticed that a culture plate of Staphylococcus aureus he had been working on had become contaminated by a fungus. A mold, later identified as Penicillium notatum (also called P. chrysogenum), had inhibited the growth of the bacteria. He at first called the substance �mould juice� and then �penicillin,� after the mold that produced it. Fleming decided to investigate further, because he thought that he had found an enzyme more potent than lysozyme. In fact, it was not an enzyme but an antibiotic�one of the first to be discovered. By the time Fleming had established this, he was interested in penicillin for itself. Very much the lone researcher with an eye for the unusual, Fleming had the freedom to pursue anything that interested him. While this approach was ideal for taking advantage of a chance observation, the therapeutic development of penicillin required multidisciplinary teamwork. Fleming, working with two young researchers, failed to stabilize and purify penicillin. However, he did point out that penicillin had clinical potential, both as a topical antiseptic and as an injectable antibiotic, if it could be isolated and purified. Penicillin eventually came into use during World War II as the result of the work of a team of scientists led by Howard Florey at the University of Oxford. Though Florey, his coworker Ernst Chain, and Fleming shared the 1945 Nobel Prize, their relationship was clouded due to the issue of who should gain the most credit for penicillin. 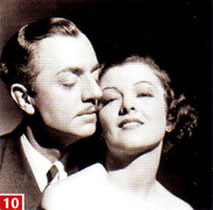 Fleming�s role was emphasized by the press because of the romance of his chance discovery and his greater willingness to speak to journalists. Fleming was knighted in 1944. In 1949 his first wife, who had changed her name to Sareen, died. In 1953, two years prior to his death, Fleming married Greek microbiologist Amalia Coutsouris-Voureka, who had been involved in the Greek resistance movement during World War II and had been Fleming�s colleague since 1946, when she enrolled at St. Mary�s Hospital on a scholarship. For the last decade of his life, Fleming was feted universally for his discovery of penicillin and acted as a world ambassador for medicine and science. Initially a shy, uncommunicative man and a poor lecturer, he blossomed under the attention he received, becoming one of the world�s best-known scientists. New technology also revolutionized the entertainment industry: Radio and 10 film sprung up as the dominant entertainment media. A consumer and leisure-oriented culture that set new fashions developed. Daily newspapers, made possible through cost-efficient technology that facilitated the mass production of the printed word, courted the favor of a growing number of readers. Neon advertising and oversize billboards established a new aspect of consumer-orientated commercialization on the streets. The entertainment industry with its 11 nightclubs and dance halls came to define a lifestyle associated with the mystique of the "Roaring Twenties." Josephine Baker (June 3, 1906 � April 12, 1975) was an American expatriate entertainer and actress. She became a French citizen in 1937. 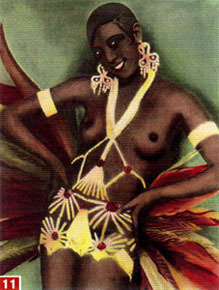 Most noted as a singer, Baker also was a celebrated dancer in her early career. She was given the nicknames the "Bronze Venus" or the "Black Pearl", as well as the "Créole Goddess" in anglophone nations. In France, she has always been known as "La Baker". Baker was the first African American female to star in a major motion picture, to integrate an American concert hall, and to become a world-famous entertainer. She is also noted for her contributions to the Civil Rights Movement in the United States (she was offered the leadership of the movement by Coretta Scott King in 1968 following Martin Luther King, Jr.'s assassination, but turned it down), for assisting the French Resistance during World War II and being the first American-born woman to receive the French military honor, the Croix de Guerre. Access to consumer goods and the spread of lifestyles through the media began to blur the lines between the middle class and the working class. The roles of the sexes began to change. 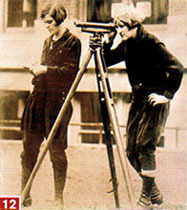 The feminist movement achieved political emancipation: women's rights to vote and run for office were introduced in most of the industrial nations after 1918. Women also increasingly 12 entered paid employment, although they often-remained blocked from positions of responsibility for a long time to come. These changes took place primarily in the industrialized United States and Europe. Much of the rest of the world took little part in this revolution, sometimes even countering the modern Western lifestyle with more traditional cultural beliefs and practices.